When I was a little kid I had many relatives that were not biologically related to me. The growth of my family began, with my parents. They tried to think of a way to introduce their adult friends to their young daughters. So we were told that we had another set of grandparents in Grandma and Grandpa Parrish. A friend of my Grandma Watts became Aunt Carol. I still think of them as family today. I also inherited a group from college that I affectionately refer to as my baseball bros. In Sarah McCoy’s book The Mapmaker’s Children her main character Sarah Brown is in much the same position. Her family has grown despite her illness and her work. Eden Anderson in the present timeline wants children badly but has not been able to have them. How will they define family? Sarah Brown is the daughter of John Brown the famous abolitionist. The story begins when Sarah finds out that because of an illness; she cannot have children. So she actively takes up her father’s cause with the Underground Railroad through her art. Her father has many supporters especially near Harper’s Ferry in a little town New Charlestown West Virginia. This family takes the Brown girls under their wing after the passing of their father. Sarah’s relationship grows with the son Freddie Hill. They meet to exchange her work and visit with his family. When Freddie asks her to marry him; will she accept? Will Sarah have a lasting legacy? Eden and Jack have just moved into the town of New Charlestown West Virginia. They need time to heal and start again. Eden has been childless for more years than she can count. She feels that a marriage is about having children and their something wrong because she can not. Should she leave Jack and start over somewhere new? Eden starts to discover artifacts in her house that date back to the previous century. Could they be related to the Underground Railroad? Could her life be fulfilled without having children? I enjoyed this story by Sarah McCoy. She has a way of making you want the best for these characters. I remember studying about John Brown but was unaware of his family. The author used the characters of Sarah and Freddie to tell the story that took place in 1859 through 1869. I also had hoped that more would come from their relationship. I also loved how she interwove both stories throughout the book. I wanted to adopt Eden’s dog. I also love how she used the dog to teach Eden how to deal with her struggles of infertility. Eden was not one of my favorite characters. I grew to like her more as the book progressed. I enjoyed it and look forward to reading more by Sarah McCoy in the future. Sarah is very active on both Facebook and Twitter. 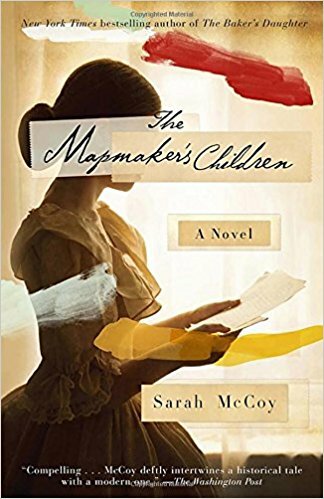 You can purchase a copy of Mapmaker's Children.